The thoughts we have about ourselves, will soon become reality. The word addict has an obviously negative connotation. Addicts, alcoholics, bulimics, and compulsive gamblers are classified by our society as deviants. We are not considered to be the “norm.” Our behavior, while in addiction, violated the expectations of our friends, family, and society. Our addictions gives (many of us) a negative self-image, thus lowering our self-esteem. Negative self-talk and low self-esteem can leave us feeling defeated and unworthy. Early in my recovery I wanted nothing more than to get free from my addiction. Being clean and drug free was not enough for me. I wanted to be free from the obsession to use. I kept hearing my counselors say that I needed to learn to love myself but I couldn’t understand how to make that happen. I wanted to learn to love myself, but how? At that point in my life, I was willing to try anything. Someone told me about positive affirmation. The first time I heard anything on the subject, I was skeptical. Was it possible by speaking in a positive manner to myself, I could change my outlook on my life or my situation? My grandpa used to say, “Attitude is ninety percent of the job.” I now believe this to be true. So, what is positive affirmation? Positive affirmations are about repeating (or writing) statements about ourselves, in present tense as if the statement is true. Affirmations are more than just repeating words; they are the first steps in choosing to think positive thoughts. Addiction takes our power of choice. It makes our choices for us. Recovery is quite the opposite. Recovery returns the power to choose back to us. You can chant, sing, or say affirmations. If you are not comfortable saying these things out loud, I recommend writing them in a journal. Daily. Writing about your feelings can also ease emotional pain. You can write your affirmations down on a card and carry them in your pocket or purse to read when irrational thoughts began creeping in. Don’t choose affirmations that are lengthy. Keep them short and sweet. 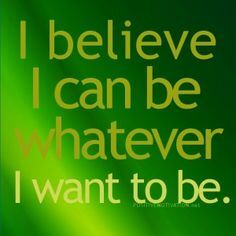 Remember to keep your affirmations positive and believe what you are writing or saying. 1. I am loved by my Creator. 2. I am worth it. 13. I am made new. 31. I am a warrior. 32. I am at rest. 36. I am a masterpiece. 37. I am not giving up. 38. I am a fighter. 39. I am a survivor. 43. I have a purpose. 1. I am confident in my recovery. 2. I am making progress. 3. I look for the good in this day. 4. I seek out positive support. 5. I am learning new coping skills. 6. I am letting go of the past. 7. I am not controlled by my addiction(s). 8. I can take care of my body. 9. I can maintain a healthy recovery. 10. I can accept each day as a learning experience. My purpose for this exercise was to retrain my mind to be more positive. It is my hope that it helps me in overcoming my addiction. I used this as part of my own form of Cognitive-Behavioral Therapy or CBT. CBT is used in an attempt to change irrational and unhealthy thought patterns. Learning to identify your negative self-talk and beliefs about yourself aids in becoming aware of how often your thinking becomes destructive. By continuing to hold on to negative thoughts, we fail at learning anything new. Finding something positive, even in a negative situation, will help give us strength, hope, and a sense of control over our emotions and thoughts. Thinking, feeling, and behaving negatively often sends us back into a vicious cycle of low self-esteem. By identifying negative problems and behaviors, we can focus on finding solutions for them. We cannot go back and change the past but we can focus on changing the future. By changing our negative, irrational thinking, we can change our negative behaviors. We can learn to see the value in ourselves and begin to love ourselves again. We must first learn to love ourselves before we can love others. Recovery is an inside job. It is about starting a new life, establishing new relationships, and finding new coping skills. Recovery begins inside the mind. Recovery is not easy, but it is worth it. I am worth it. You are worth it. We are worth it. I would be lying if I said that I am always overflowing with confidence. But, I can honestly say that my opinion of myself has drastically changed over the past fifteen months. I will give the credit of this to positive affirmation. I am still learning to love myself but I love myself more today than I did six months ago. Lasting change doesn’t happen overnight. Change is work. It takes effort and can be painful at times. It takes time to control your negative, irrational thoughts but what do you have to lose?Whether you are suffering in addiction, new in recovery, or feeling “stuck” in your recovery journey, try using some affirmations to spark a change in your mindset. Positive affirmations are not a magical cure but, they most certainly assist in breaking the cycle of negative and unhealthy thought patterns. My name is Candace, and I’m a recovered addict since 6.17.14.